"It also provides a functional explanation for why women find tall men attractive," Carrier adds. "Early in human evolution, an enhanced capacity to strike downward on an opponent may have given tall males a greater capacity to compete for mates and to defend their resources and offspring. If this were true, females who chose to mate with tall males would have had greater fitness for survival." Carrier's new study is being published May 18 in the online Public Library of Science journal PLoS ONE. The idea is not new that fighting and violence played a role in making human ancestors shift from walking on all fours to walking on two legs. But Carrier's new study physically demonstrates the advantage of fighting from an upright, two-legged posture. Carrier measured the force of punches by male boxers and martial arts practitioners as they hit in four different directions: forward, sideways, down and up. 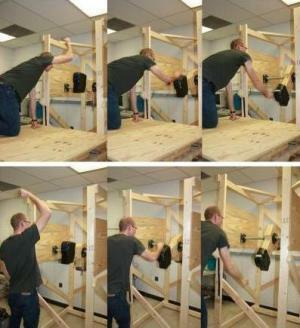 A punching bag fitted with a sensor measured the force of forward and sideways punches. For strikes downward and upward, the men struck a heavy padded block on the end of a lever that swung up and down because it was suspended from an axle. In either case, the men struck the target as hard as they could both from a standing posture and on their hands and knees. The findings: for all punching angles, men hit with far more force when they were standing, and from both postures they could hit over twice as hard downward as upward. The transition from four-legged to two-legged posture is a defining point in human evolution, yet the reason for the shift is still under debate. Darwin thought that our ancestors stood up so they could handle tools and weapons. Later scientists have suggested that bipedalism evolved for a host of other reasons, including carrying food, dissipating heat, efficient running and reaching distant branches while foraging in trees. "Others pointed out that great apes often fight and threaten to fight from bipedal posture," says Carrier. "My study provides a mechanistic explanation for why many species of mammals stand bipedally to fight." Carrier says many scientists are reluctant to consider an idea that paints our ancestors as violent. "Among academics there often is resistance to the reality that humans are a violent species. It's an intrinsic desire to have us be more peaceful than we are," he says. Nevertheless, human males and their great ape cousins -- chimpanzees, gorillas and orangutans -- frequently fight each other for territory and access to females. The most popular theories about why we became bipedal are based on locomotor advantages -- increases in the efficiency of walking and running. However, research shows upright posture is worse for locomotion, contrary to what Carrier initially believed. "If you're a chimpanzee- or gorilla-type ancestor that is moving on the ground, walking bipedally has a cost," he says. "It's energetically more expensive, it's harder to speed up and slow down, and there are costs in terms of agility. In every way, going from four legs to two is a disadvantage for locomotion. So the selective advantage for becoming bipedal, whatever it was, must have been important." Nearly all mammals, including chimps and gorillas, move on all fours when they run or cover long distances on the ground. On the other hand, all sorts of four-legged animals stand up and use their front legs to fight. They include anteaters, lions, wolves, bears, wolverines, horses, rabbits and many rodents and primates. Carrier believes that the usefulness of quadruped forelegs as weapons is a side effect of how forelegs are used for walking and running. When an animal is running with its body positioned horizontally, the forelegs strike down at the ground. By lifting the body to a vertical posture, animals can direct that same force toward an opponent. In addition, quadrupeds are stronger pulling back with their forelimbs than pushing forward. That translates to a powerful downward blow when they rear up on their hind legs. These advantages, which grow directly out of four-legged movement, can be used most effectively by an animal that can stand easily on two legs. Carrier predicted that animals would hit harder with their forelegs when their bodies were held upright than when they were horizontal, and that they would hit harder downward than upward. Although it would be ideal to test these hypotheses with four-legged animals, humans should still possess the advantages that led our ancestors to stand upright, and they are more practical test subjects. The results were exactly what Carrier expected. Men's side strikes were 64 percent harder, their forward strikes were 48 percent harder, their downward strikes were 44 percent harder, and their upward strikes were 48 percent harder when they were standing than when they were on their hands and knees. From both postures, subjects delivered 3.3 times as much force when they hit downward rather than upward. Do Women Want Men Who Can Fight? While Carrier's study primarily deals with the evolution of upright posture, it also may have implications for how women choose mates. Multiple studies have shown that women find tall men more attractive. Greater height is also associated with health, social dominance, symmetrical faces and intelligence in men and women. These correlations have led some scientists to suggest that women prefer tall men because height indicates "good genes" that can be passed on to offspring. Carrier believes there is more to it. "If that were the whole story, I would expect the same to be true for men -- that men would be attracted to tall women. But it turns out they're not. Men are attracted to women of average height or even shorter," he says. The alternative explanation is that tall males among our ancestors were better able to defend their resources, partners and offspring. If males can hit down harder than they can hit up, a tall male has the advantage in a fight because he can punch down to hit his opponent's most vulnerable targets. Carrier certainly isn't saying women like physically abusive men or those who get into fights with each other. He is saying that women like tall men because tallness is a product if the evolutionary advantage held by our ancestors who began standing upright to fight. "From the perspective of sexual selection theory, women are attracted to powerful males, not because powerful males can beat them up, but because powerful males can protect them and their children from other males," Carrier says. "In a world of automatic weapons and guided missiles, male physical strength has little relevance to most conflicts between males," he adds. "But guns have been common weapons for less than 15 human generations. So maybe we shouldn't be surprised that modern females are still attracted to physical traits that predict how their mates would fare in a fight." The above story is reprinted (with editorial adaptations by ScienceDaily staff) from materials provided by University of Utah, via EurekAlert!, a service of AAAS.